Julie’s own history follows the Legend of Benjamin Twiggs. His family dreamed of the New World. A terrible storm marked their journey; Alone and orphaned he started again from scratch, planted in fertile soil, and gave back. Julie grew up with an idyllic family: a successful dad, stay-at-home mom, older sister, and younger brother. She nurtured a passion for computers into a career as a Systems Engineer for tech giants in Dallas, Texas. I’m a computer nerd from way back – all the way back to the early ‘80’s when the only computers were owned by companies or universities, filled entire rooms and spit out data cards like a one-armed bandit spits quarters. Her whirlwind relationship led to marriage, three beautiful children, and a fast-track to early retirement while affording the opportunity to push pause on her career – and dedicate her life to family. Full-time mom life is one of the things she treasures most. Serendipity led Julie to the same “Land of the Sweetwater Seas” that Benjamin Twiggs made his home. Julie’s temporary relocation became a love-affair with Traverse City, and she permanently put down roots. Just 11 years from her planned retirement, Julie experienced the howling winds of an unexpected divorce. Already buffeted, one wave after another crashed. A routine mammogram led to a follow-up, biopsy, breast cancer, oncologist, surgery, chemo, radiation. She was alone in the storm. No. Not me. Not now. Not by myself. The next seven months were all cancer, all the time. But Julie wasn’t without support. She humbly accepted help from her sister (drove from Cincinnati to Traverse City every other weekend) and her friends. They took her to chemo, brought meals, and drove her to her son’s hockey games. With three busy teenagers, these gestures of tremendous kindness helped restore a semblance of normalcy to an overwhelmed mom. When seven months of the cancer-treatment storm finally abated, the clouds remained. There’s a fog called “chemo brain” that lingers for cancer survivors. In Julie’s case, this memory and concentration problem lasted a full year after treatment. This didn’t help the fact that her cutting-edge computer training was now long outdated, and it was time to find a new career. I took on a few odd jobs – office work and digital manipulation for a local photographer. The reality was that I had to make some money while I tried to discover where my passion might lie. Enter cherries. Cherries only germinate after a period of “cold stratification,” months at near-freezing temperatures. 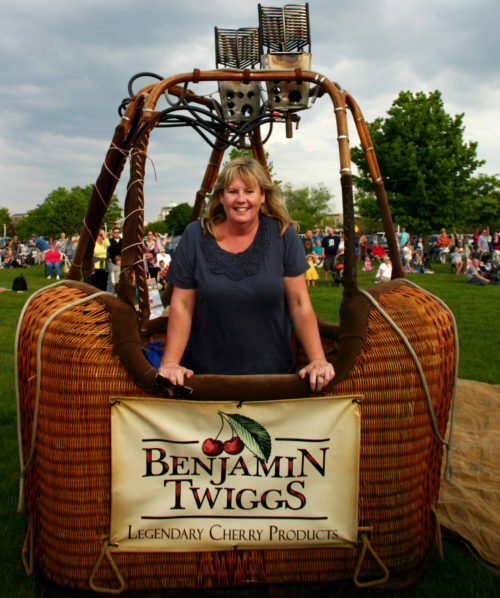 Julie had always enjoyed the National Cherry Festival in Traverse City and dutifully shipped cherry products to her out-of-state friends and family. One day, that “seed” of cherries began to sprout. A friend that owned a local cherry shop asked her to help out a few days per week during the holidays. The job was delightful. She enjoyed heartwarming stories by loyal customers and delicious products. This new shoot of personal growth would only accelerate when one day the owner said, “I want to sell the company.” Just like Benjamin Twiggs, Julie had found her cherry purpose. With no retail management experience, but tremendous determination, she found herself the proud new owner. This was a giant leap of faith but I was determined to make it work. With the help of a dedicated staff, those wonderful customers and – of course – delicious cherry products, we’ve made a go of it. Julie dug in. She hired the best foodies she could find, redecorated, and updated the computer systems. She’s had significant growth, doubled her local store space, and increased Benjamin Twigg’s presence in both the local community and online. She’s a true purveyor of Legendary Cherry Goods, both near and far. As a cancer survivor, Julie is grateful. She knows her prognosis could have been much worse. She’s dedicated to lifting up others that are following that tough road. Owning my own business has been one of the most exhilarating, exhausting, and exciting adventures of my life. It has also given me the unique opportunity to pay it forward to the women in the community who are diagnosed with cancer. Every October, Julie and Benjamin Twiggs donate 5% of food sales to the Women’s Cancer Fund. At the time of this publication, she’s donated around $15,000 which assists local women for non-medical expenses like wigs, child care, rent, and transportation. Kindnesses like these are things she can never repay from her own battle – but watch her try. Also like Benjamin Twiggs, Julie is happy to share her knowledge. Her inspiring story, her community involvement, and her philanthropy (like Impact 100 Traverse City) continue to help other women find their strength and empowerment within. These quotes from Julie came from a 2011 Feature article in the GT Woman’s magazine: Computer Nerd. Cherry Mogul. Survivor. Since then, Julie continues to inspire, give, and support local causes – especially side-by-side with cancer survivors and strong women.